The Samsung Galaxy E7 comes with both the stock Android browser (heavily customized by Samsung) and Google's Chrome. Both support multiple tabs (including incognito ones) and an option to go straight to the desktop version of a page. Both apps can work with Multi Window and feature tab syncing. The good news here is that Firefox users can sync tabs with the Internet app (which can also sync with your Samsung account). Chrome users can sync between all versions of the Google browser. Chrome has another trick up its sleeve - it can reduce traffic by compressing web pages on Google's servers before they are sent to the device, similar to how Opera's Turbo mode (and Opera Mini) work. As if that wasn't enough browsers, you also get the option of using Opera Mini. Why you would do that is unclear though, as the app is painfully slow and has its own take on rendering the web pages. If you're used to it from a previous device though, it will provide seamless transition to the Galaxy E7. S Planner is the default calendar. It features five different views: daily, weekly, monthly, yearly and agenda. The Month and Agenda views use a split-screen interface to conveniently show all events on a given day, for any day of the month. Multiple online calendars are supported, complete with color coding. The Memo app is fairly powerful, you can add images and voice notes in each memo and sort those in multiple categories. Notes are synced with a server, which is handy if you have several Samsung devices. The clock app has an alarm clock, World clock, stopwatch and timer modes. Smart alarm can wake you gently by starting a quiet sound that builds over a few minutes before the raw ringer kicks in. My Files sorts files by their type (video, document, downloaded files etc. ), but can also be used to freely browse the folder structure on the internal and microSD storage. The Voice recorder app is pretty advanced. It can tag recordings with your location and features several modes that make the most use of the two mics. The Conversation mode, for example, records sound equally from the bottom (your voice) and the top (the other person's voice). There's a voice transcription option too. Noise-reduction is built-in. 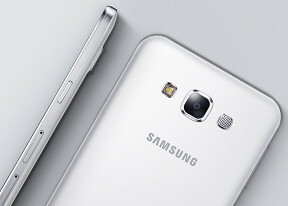 Aside from the Google Play store you get Samsung Galaxy apps - the store for exclusive content for Galaxy smartphones.